A 2016 United Nations estimate puts the total population at 38,140,000. It covers an area of approximately 13,500 km2 (5,200 mi2), giving it a population density of 2,642 person/km2. It is the second largest single metropolitan area in the world in terms of built-up or urban function landmass at 8,547 km2 (3,300 mi2), behind only New York City at 11,642 km2 (4,495 mi2). The area has the largest metropolitan economy in the world, with a total GDP (nominal) of approximately $2 trillion (¥165 trillion) in 2008. According to research published by PricewaterhouseCoopers, the agglomeration of Tokyo had a total GDP of $1.5 trillion in 2008 (at purchasing power parity), ranking again as the largest urban agglomeration GDP in the world. Growth of densely inhabited districts (DIDs, defined as >4,000 people/km2 or >10,355 people/mi2) of suburb Saitama city (outlined) of northern Greater Tokyo, 1960s to 2010. Notice how the densely populated zones grow along railway lines and stations, the purple circles and lines. Green southern border is Tokyo. There are various definitions of the Greater Tokyo Area, each of which tries to incorporate different aspects. Some definitions are clearly defined by law or government regulation, some are based coarsely on administrative areas, while others are for research purposes such as commuting patterns or distance from Central Tokyo. Each definition has a different population figure, granularity, methodology, and spatial association. Tokyo Metropolitan Employment Area (東京大都市雇用圏, Tōkyō Dai-toshi Koyō-ken) All municipalities that have at least 10% of their population commuting to the 23 special wards. Figures for this definition are complex to update without a major re-study. Notes & Sources: All figures issued by Japan Statistics Bureau, except for Metro Employment Area, a study by Center for Spatial Information Service, the University of Tokyo. Abbreviations: CF for National Census Final Data (every 5 years by JSB), CR for Civil Registry (compiled by local governments, monthly as per legal requirement), CP for Census Preliminary. The National Capital Region (首都圏, Shutoken) of Japan refers to the Greater Tokyo Area as defined by the National Capital Region Planning Act (首都圏整備法, Shutoken-seibi-hō) of 1956, which defines it as "Tokyo and its surrounding area declared by government ordinance." The government ordinance defined it as Tokyo and all six prefectures in the Kantō region plus Yamanashi Prefecture. While this includes all of Greater Tokyo, it also includes sparsely populated mountain areas as well as far-flung Bonin Islands which are administered under Tokyo. Using the "One Metropolis Three Prefectures" definition, Tokyo is 13,555.65 square kilometres (5,233.87 sq mi), a similar size to that of Los Angeles County, and almost two-thirds smaller than the Combined Statistical Area of New York City, at 30,671 square kilometres (11,842 sq mi) and 21.9 million people. Other metropolitan areas such as Greater Jakarta are considerably more compact as well as more densely populated than Greater Tokyo. The South Kantō region (南関東, Minami Kantō) is a potentially ambiguous term. Informally, it may mean the One Metropolis, Two Prefectures, or the area without Saitama Prefecture. Formally, it may mean the South Kantō Block, which is not the Greater Tokyo Area, but a proportional representation block of the national election, comprising Kanagawa, Chiba, and Yamanashi Prefectures. In informal occasions, the term National Capital Region (首都圏, Shuto-ken) often means Greater Tokyo Area. Officially, the term refers to a much larger area, namely the whole Kantō region and Yamanashi Prefecture. ), which are officially part of Greater Tokyo, but are wilderness or rustic areas. Tokyo is legally classified as a to (都), which translates as "metropolis", and is treated as one of the forty-seven prefectures of Japan. 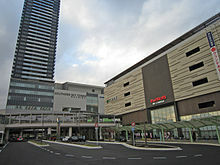 The metropolis is administered by the Tokyo Metropolitan Government as a whole. Central Tokyo, situated in the eastern portion of Tokyo Metropolis, was once incorporated as Tokyo City, which was dismantled during World War II. Its subdivisions have been reclassified as special wards (特別区, tokubetsu-ku). The twenty three special wards currently have the legal status of cities, with individual mayors and city councils, and they call themselves "cities" in English. However, when listing Japan's largest cities, Tokyo's twenty three wards are often counted as a single city. Tighter definitions for Greater Tokyo do not include adjacent metropolitan areas of Numazu-Mishima (approx. 450,000) to the southwest, Maebashi-Takasaki-Ōta-Ashikaga (approx. 1,500,000 people) on the northwest, and Greater Utsunomiya (ja:宇都宮都市圏) approx. 1,000,000) to the north. If they are included, Greater Tokyo's population would be around 39 million. At the centre of the main urban area (approximately the first 10 km from Tokyo Station) are the 23 special wards, formerly treated as a single city but now governed as separate municipalities, and containing many major commercial centres such as Shinjuku, Shibuya, Ikebukuro and Ginza. Around the 23 special wards are a multitude of suburban cities which merge seamlessly into each other to form a continuous built up area, circumnavigated by the heavily travelled Route 16 which forms a (broken) loop about 40 km from central Tokyo. Situated along the loop are the major cities of Yokohama (to the south of Tokyo), Hachiōji (to the west), Ōmiya (now part of Saitama City, to the north), and Chiba (to the east). Within the Route 16 loop, the coastline of Tokyo Bay is heavily industrialised, with the Keihin Industrial Area stretching from Tokyo down to Yokohama, and the Keiyō Industrial Zone from Tokyo eastwards to Chiba. Along the periphery of the main urban area are numerous new suburban housing developments such as the Tama New Town. The landscape is relatively flat compared to most of Japan, most of it comprising low hills. Outside the Route 16 loop the landscape becomes more rural. To the southwest is an area known as Shōnan, which contains various cities and towns along the coast of Sagami Bay, and to the west the area is mountainous. Many rivers run through the area, the major ones being Arakawa and Tama River. Tokyo has the largest city economy in the world and is one of three major global centers of trade and commerce along with New York City and London. The agglomeration of Tokyo is the world's largest economy, with the largest gross metropolitan product at purchasing power parity (PPP) in the world according to a study by PricewaterhouseCoopers. The Greater Tokyo Area has two major airports, Tokyo International Airport, commonly known as Haneda Airport (previously chiefly domestic, now increasingly also international flights) and Narita International Airport (chiefly international). Minor facilities include the Chōfu, Ibaraki Airport, and Honda Airport. Tokyo Heliport serves helicopter traffic, including police, fire, and news. Various military facilities handle air traffic: Naval Air Facility Atsugi (United States Navy and Japan Maritime Self-Defense Force), Yokota Air Base (United States Air Force), and Camp Zama (United States Army). Greater Tokyo has an extensive railway network comprising high-speed rail, commuter rails, subways, monorails, private lines, trams and others. There are around 136 individual rail lines in the Greater Tokyo Area, and between 1,000 and 1,200 railway stations depending on one's definition of the area, most designed for heavy use, usually long enough to accommodate 10-car trains. Stations are designed to accommodate hundreds of thousands of passengers at any given time, with miles of connecting tunnels linking vast department stores and corporate offices. Tokyo Station has underground connections that stretch well over 4 kilometers, and Shinjuku Station has well over 200 exits. Greater Tokyo's Railway Network is easily considered the world's largest in terms of both daily passenger throughput with a daily trips of over 40 million (20 million different passengers) as well as physical extent with approximately 2,578 kilometers of track. Shinjuku station is used by an average of 3.34 million people per day, making it the world's busiest train station. Some 57 percent of all Greater Tokyo residents used rail as their primary means of transport in 2001. JR East and many other carriers crisscross the region with a network of rail lines. (See this map showing the Suica/PASMO accepting area that roughly corresponds with Greater Tokyo). The most important carriers include Keihin Kyūkō Electric Railway (Keikyū), Keisei Electric Railway, Keiō Electric Railway, Odakyū Electric Railway, Seibu Railway, Tōbu Railway, and Tōkyū Corporation. In addition to Tokyo's two subway systems — Tokyo Metro and Tokyo Metropolitan Bureau of Transportation (Toei and Toden lines), Yokohama operates three lines. The Tokyo Monorail provides service to Haneda Airport and other destinations. The Shuto Expressway system connects other national expressways in the capital region. Tokyo and Yokohama are major commercial seaports, and both the Maritime Self-Defense Force and United States Navy maintain naval bases at Yokosuka. ^ "Megacities in 2014 and 2030". GeoHive. Archived from the original on 2016-01-17. Retrieved 9 January 2016. ^ a b "Global city GDP rankings 2008-2025". Pricewaterhouse Coopers. Archived from the original on 31 May 2013. Retrieved 27 November 2009. ^ Parilla, Alan Berube, Jesus Leal Trujillo, Tao Ran, and Joseph (22 January 2015). "Global Metro Monitor". ^ "demographia.com - World urban areas" (PDF). ^ a b c Yoshitsugu Kanemoto. "Metropolitan Employment Area (MEA) Data". Center for Spatial Information Science, The University of Tokyo. 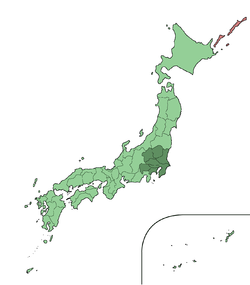 ^ "Japan Statistics Bureau - Population figures for metropolitan areas". ^ "Japan Statistics Bureau - Population figures for range of distance". ^ "Annual Average Exchange Rate". Archived from the original on 2009-04-01. Retrieved 2018-12-28. ^ "City Mayors reviews the richest cities in the world in 2005". www.citymayors.com. ^ "Urban Transport Fact Book - Tokyo-Yokohama suburban rail summary" (PDF).